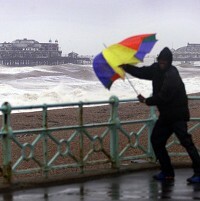 The cold start to 2013 and prospect of another summer washout is turning more holidaymakers away from breaks at home in favour of chasing the sun overseas, according to new research. Almost three quarters (73%) of Brits polled in the BDRC Continental Annual Holiday Trends Survey said they were looking to book tickets for holidays abroad, compared to 66% last year. The vast majority of people are looking for more than a week away, with 95% saying they were booking breaks of seven nights or more. That's up 6% on the 89% of people who said the same in 2012. With more people planning to go abroad there'll likely be an increase in demand for travel insurance too. In recent years the number of people choosing 'staycations' and holidaying in the UK has risen, but that doesn't seem to be the case in 2013 so far and the survey found the dreary weather is the main reason. Steve Mills, director of BDRC Continental, said outbound tour operators and travel agents are reporting a strong start to 2013 in terms of overseas holidays. He added that the recent "dire" weather conditions in the UK are beginning to take their toll on the "staycation effect".